This was our first trip to Red Rock Canyon State Park. We were there 2 full days and 3 nights. 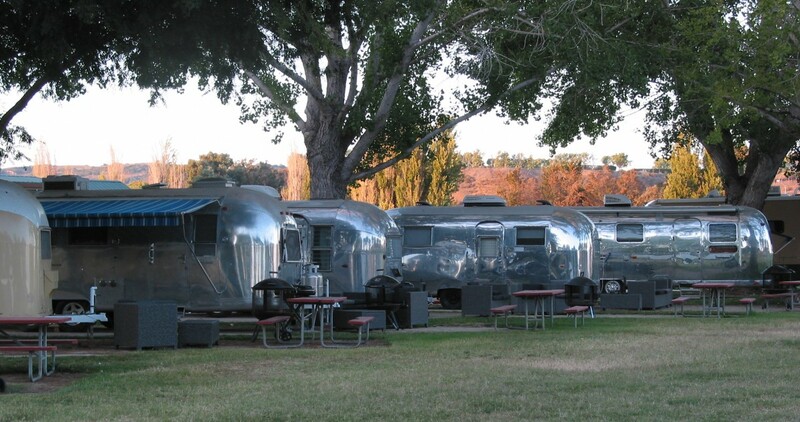 The Ricardo Campground doesn’t take reservations, so it’s advisable to arrive on a weekday as it does get crowed on weekends during the fall and spring months. There is free BLM camping all around this area, if you are so inclined, which is mainly used by off-road vehicle enthusiasts. We arrived on a Tuesday, so there were not many other campers. This gave us the luxury of driving around the campground to check out and choose the best campsite available. We chose site 19, which is right next to some stunning rock formations. In our opinion, this was the nicest campsite in the campground. There are no RV hookups and the dump station is closed. There are dump stations in nearby towns so that’s not too big of a deal. There is almost no phone or Internet service. To connect, we had to go to the visitor center and even there service was spotty at best. The rocks, in the Red Rock Canyon area, have a rich geological history that spans 14 million years. Erupting volcanoes, sediments and a very active earthquake fault all shaped the geology in the area. Prehistoric animal fossils from 7 to 12 million years old have been found in the sediments. Bone fossils of extinct elephants, rhinos, three-toed horses, giraffe-like camels, saber-toothed cats and huge dogs are on display in the visitor center. If you are going to visit the park and want to see what’s in the visitor center, check the website to make sure it’s going to be open. The campground is open all year but the visitor center is closed during the winter and summer months. Red Rock is in the desert so it gets brutally hot in the summer and really cold during the winter. Not many people camp here during those months. During our visit, the visitor center was open Thursday thru Sunday. One of the first things we did on Wednesday, our 1st full day in Red Rock, was to take a hike on the Hagen Nature Trail, which winds through Hagen Canyon. This trail is the most popular in the park. A German immigrant, Rudolph Hagen, named Hagen Canyon. He got the land by buying mining claims. Mr. Hagen ran the place as a private park for a number of years and after he died, his family ran the park for a while until it became a State Park in 1969. The whole place used to be under water. Ten million years ago, Red Rock Canyon was at the bottom of a massive lake. Layers of sediment from volcanoes and run-off from mountains settled on the bottom of the lake. Under pressure in the lake, the sediment formed into large rock beds. At some point the near-by earthquake fault, the Garlock Fault a mile away, ruptured, lifting up the bottom of the lake and the lake dried up. One side of the fault was driven upwards, mostly at a 17 degree angle, revealing all the sediment layers from millions of years ago. Wind and water erosion created the rock formations. The red in the rocks is due to the high iron content rusting in sediment layers. When it rains hard, the rusted sediment runs down the rock formations making them appear to bleed. In some ways, this place kind of reminded us of Bryce Canyon in Utah, because both were created by water, both have some huge, fantastic rock formations and both are in deserts. Right after hiking the Hagen Canyon Nature Trail, we hiked the Red Cliffs loop trail, which is just down the road. When we first pulled into the parking area, we were stunned at the size of the rock formations. Here is a picture taken from the trail we hiked. Note our tiny looking black truck in the parking area. It’s not a tiny truck. The Red Cliffs trail is a fairly easy 1 mile loop trail that’s on the border of the Mojave Desert, the Eastern Sierra Nevada range, and the western El Paso range. The hike wanders along the base of the cliffs, which you can walk up to and explore, then up onto a ridge where you get nice views across to the Red Cliffs, on one side, rolling hills and desert on the other side. Keep your eyes out for wildlife. We saw lots of desert hares and lizards. Desert tortoise and Roadrunners are also around, but harder to spot. We didn’t see either on this hike. You’d think that two hikes would finish our day, but wait … there’s more! After Red Cliffs, we planned to make a quick stop at a place called Iron Canyon but we missed the turnoff and ended up on a road that took us to a ghost town called Randsburg. Randsburg started out as a small gold mining operation called “Rand Camp”. The town was founded in 1895, and by 1896 it had grown enough to have a post office and a sizable population. In it’s heyday the town had a soda bottling plant, a bowling alley, dance halls, pool halls, a resident psychic and taxidermist. The extreme desert heat, the remote location, legal issues plaguing the mines all contributed to the death of Randsburg and so it slowly emptied out. I guess technically Randsburg is a “living” ghost town since 69 people do live there. The town is about two square miles in size and has a few functioning businesses mixed in among abandoned storefronts. We were there on a Wednesday afternoon and not one business was open, not even the two bars. From the signs on storefronts, it looks like town businesses only open on weekends and mostly cater to off-roaders and tourists. Thursday morning we visited the Red Rock Canyon Visitor Center, which is small, but very informative. The displays speak to the history and geology of the area. In addition, a portion of the center has been dedicated to the many movies and TV shows that have been filmed in Red Rock Canyon State Park. Just outside the Visitor Center door is a little fenced off area that has cholla cactus growing in it. At a quick glance, some of the cactus arms look like they have small piles of trash stuck on them. Turns out the trash piles are Cactus Wren nests and if you get too close, the wrens will squawk loudly and agressively at you. Our next stop of the day was at the Jawbone Station Visitor Center that is a base for the Bureau of Land Management which oversees the Jawbone Canyon Off-Highway Vehicle Area. This place is dedicated to all skill-levels of OHV riding and has excellent primitive camping sites. OHV trail maps and local history are featured in the Visitor Center as well as a small book store. And then there’s “Mr. Bob”. Mr Bob lives just outside the Visitor Center front door in a fenced area. He’s been there 18 years and is 120 years old. Mr. Bob doesn’t like wind and since it was a very windy day, he didn’t come out to visit us. We ended the day with a hike up a trail that starts in the Ricardo campground and ends up on top of the rock formations that border the campground. We did initially hesitate to take this hike because of very, very strong winds, but decided to hike anyway because we had been loafing around all day and needed the exercise. When we got up to the ridge that follows the top of the rock formations, I honestly thought the wind was going to blow my wife away like a lawn chair in a tornado. She had to stop several times and brace herself against the wind using her hiking sticks. We cut this hike off short because of the wind. We will be returning to Red Rock Canyon State Park since we only had time explore a small fraction of what it has to offer. We’d like to look for fossils of prehistoric animals that have been found in the sediments. The area was once home to the Kawaiisu Indians, who left petroglyphs in the El Paso mountains that we’d like to see. There are many more hiking trails to explore and historic sites waiting for us. Maybe next time we’ll even get to see Mr. Bob! Previous Previous post: Bighorn Sheep Rule Anza Borrego SP!